Philippine Air Force on May 15 sent UH-1Ds helicopters to Casiguran town to participate in an exercise simulating response to the area being isolated by a big typhoon. The exercise was under a joint military drill called Balikatan between the Southeast Asian country and the United States. 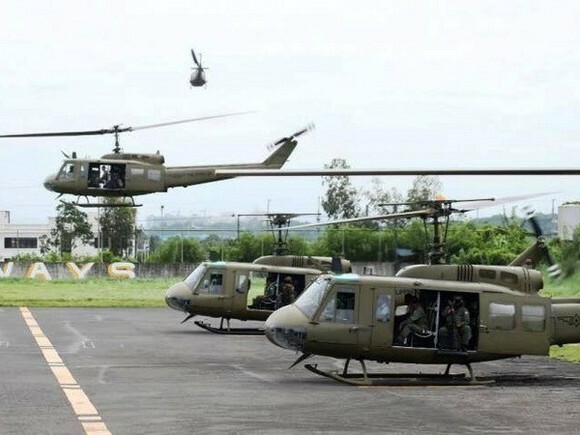 The UH-1Ds helicopters (Hueys) conducted aerial reconnaissance to survey the worst-hit regions and secure the nearest landing area for rescue teams, said Major Celeste Frank Sayson of Public Affairs Office of the Armed Force of the Philippines. The Philippine Navy’s first Strategic Sealift Vessel team, Tarlac, coordinated with the country’s army at Casiguran port to carry supplies to evacuation centres, he added. According to Major Sayson, US advisors was on the exercise to share experiences on sealifts and disaster response. The annual Balikatan 2017 exercise began on May 8 with the participation of 2,800 Philippine and 2,600 US soldiers along with those from Japan and Australia. This year’s drill, which is schedule to finish on May 19, focuses on disaster response and humanitarian assistance instead of landing and live fire exercises in previous years.